After Target announced that they would be making their toy section gender neutral—no signs demarcating toys for “girls” or “boys”—some people were upset by the move and took to Target’s Facebook page. They didn’t expect the response they got from user Mike Melgaard, who pretended to be an official Target customer service account. All Melgaard needed to fuel outrage and confusion was a Facebook account he created called Ask ForHelp that sported Target’s bullseye logo. Ask ForHelp was obviously not verified, but most people didn’t care, interacting with Melgaard and growing increasingly irate as he trolled their gender neutral hatin’ ways. Ars Technica points out that “rather than checking for a verified blue checkmark,” they believed that Ask ForHelp was legit at first glance and sought repeatedly to report him to Target overlords. When Melgaard screencapped his shenanigans and posted them to Facebook, the prank went viral. 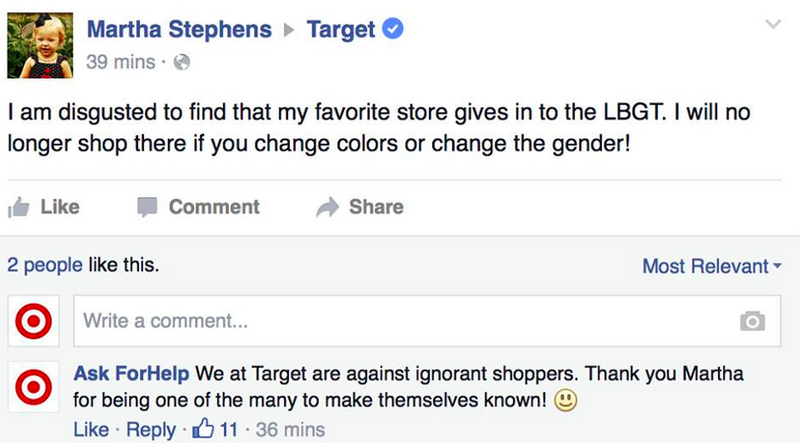 The comments following Target’s toy signage announcement are surprisingly nasty. It’s evident from some of the posts that people weren’t sure what the announcement meant, accusing Target of a wide range of politically correct capitulations and declaring their intention to now shop at Walmart. Usually such comments would go unread or receive a neutral customer service response. Melgaard had other plans.